Free Shipping on orders of 3 dozen (36 pair, mix and match sizes) of Atlas 451 place now through 11/14/2014. The ThermaFit Gloves are popular for cold weather chores and gardening. They have a cotton/polyester double napped acrylic liner that provides a cushion of air to protect hands from cold applications, as well as natural rubber coating on the palm and fingertips to offer excellent abrasion resistance. 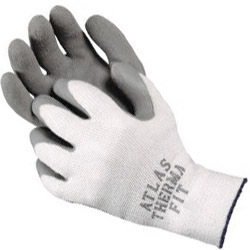 The Atlas 451 (300-I) ThermaFit has PolyCotton/Acrylic liner. The ThermaFit has a tough natural rubber coating on a thicker, warmer liner ideal for cold weather chores and gardening.